You’ve probably already picked up on this little tidbit about my taste buds, what with the recipes for pork chops with rhubarb & fig compote and the bacon & nectarine sandwiches: I have a mad weakness for pork paired with fruit. And on the subject of food weaknesses, I’ve got to mention Italian plums. This time of year, I just cannot get enough of them. I’ll throw back half a dozen just trying to get them home from the grocery store. I should really put my shopping bag in the trunk; the plums and baguettes would be much safer. But yesterday, I showed a little restraint. 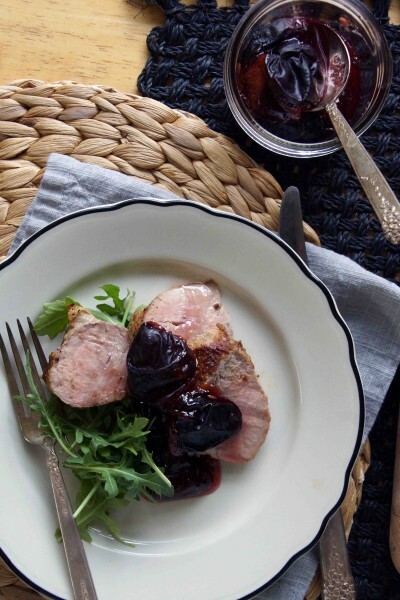 I managed to get a whole big bag of the plums home and turned them into a sweet-savory jam to serve with a roasted pork tenderloin. I’m happy to say it was well worth the sacrifice. So let’s make dinner. We’ll start with the plums. I’m borrowing a technique I saw on Food52 for a roasted tomato jam, using plum instead and switching up some of the flavors. 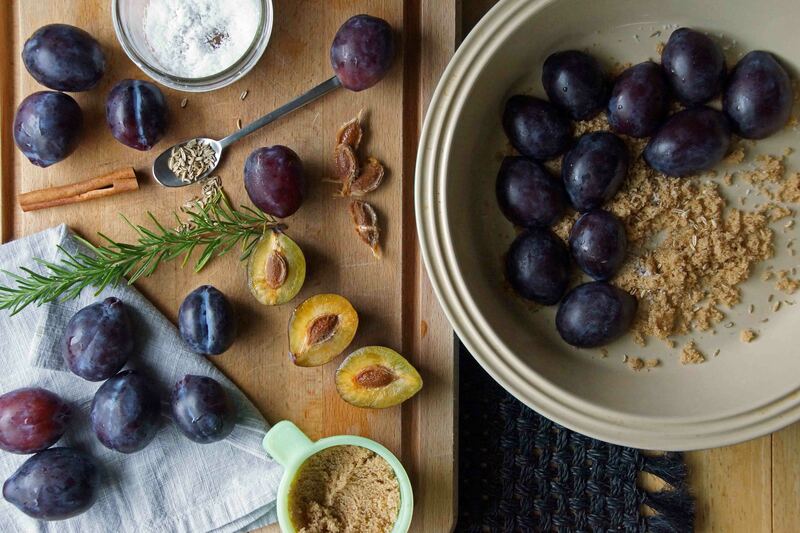 We’re just going to cut our plums in half and layer them in a baking dish with brown sugar, a sprig of rosemary, cinnamon stick, and smattering of crushed fennel seeds. Season with salt and pepper and up the acidity with a splash of red wine vinegar. 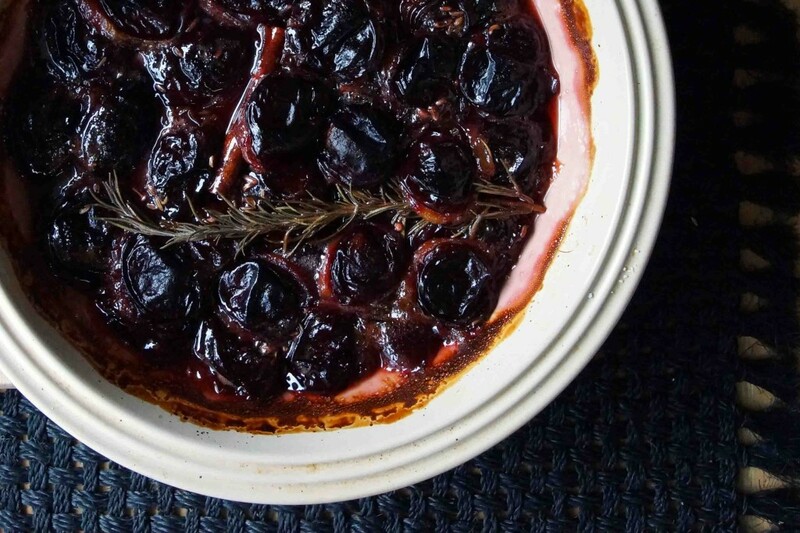 Pop them in the oven to roast until they’re dark, sticky, and halfway to becoming prunes. The fruit breaks down and the juices, sugar, and vinegar turn thick and jammy. Oh, did I mention how good your house is going to smell? Really good. Lose-your-mind good. You might find yourself behaving like my dog and licking the air. It’s okay, no one’s watching. 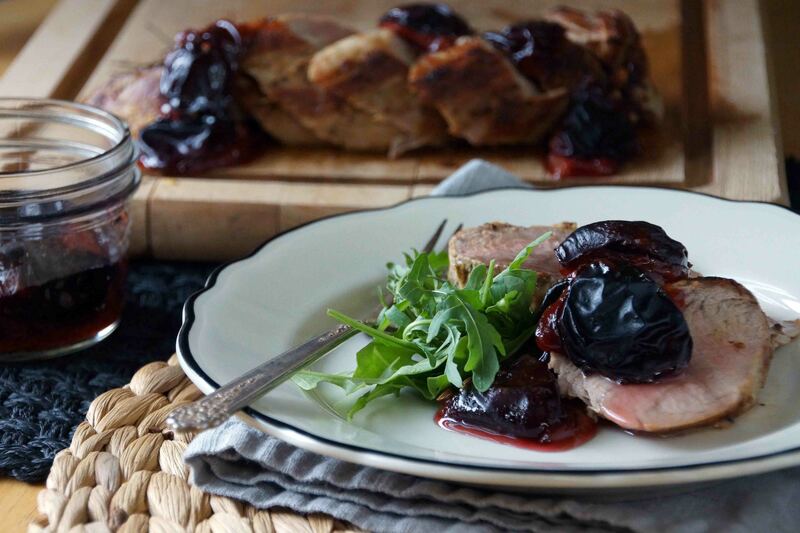 As your plums are nearing ready, get your pork cooking. We’ll rub the tenderloin with salt, pepper, and crushed fennel, then smear it with Dijon mustard. Sear it on the stove, then transfer to the oven to finish. When you pull the pork out of the oven, let it rest under foil for 10 minutes, before slicing. Set the table, open some wine, try not to let the anticipation kill you. I entered into writing this post thinking of fruit and pork as my weakness, but I’m ending thinking of it as my strength, part of my style. A way of life. Too far? Maybe, but it’s awfully good. If you have extra plum jam, it would surely be a nice addition to a cheese plate. Sprinkle half of the brown sugar, salt, fennel seeds, and pepper in the bottom of a pie pan or square baking dish. Place about half of the plum halves, cut-side down, over the brown sugar mixture. 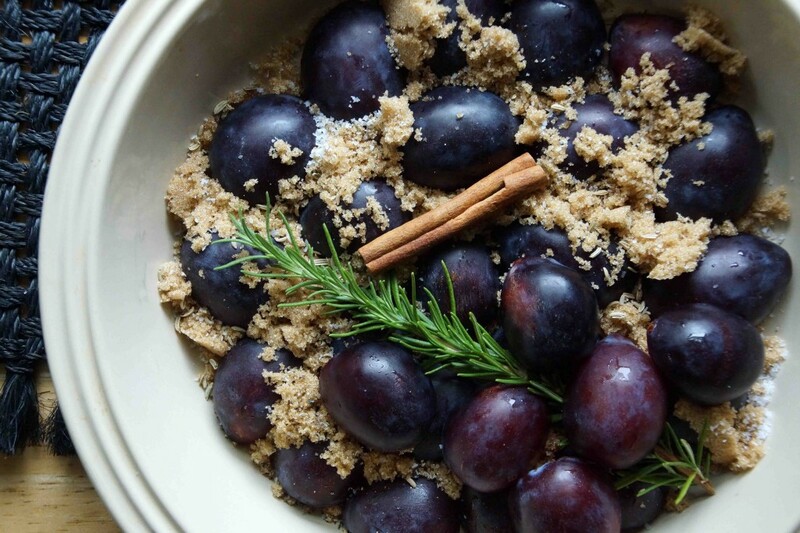 Place the rosemary sprig and cinnamon over the top, sprinkle with the remaining sugar and seasonings, and top with the remaining plums. Pour the vinegar over the plums. Bake until the plums are barely holding their shape and the juices are thick and have started to gel, about 1 hour. When the plums are about halfway through roasting, start preparing the pork. Combine the salt, pepper, and fennel seeds in a small bowl, then rub into the pork. 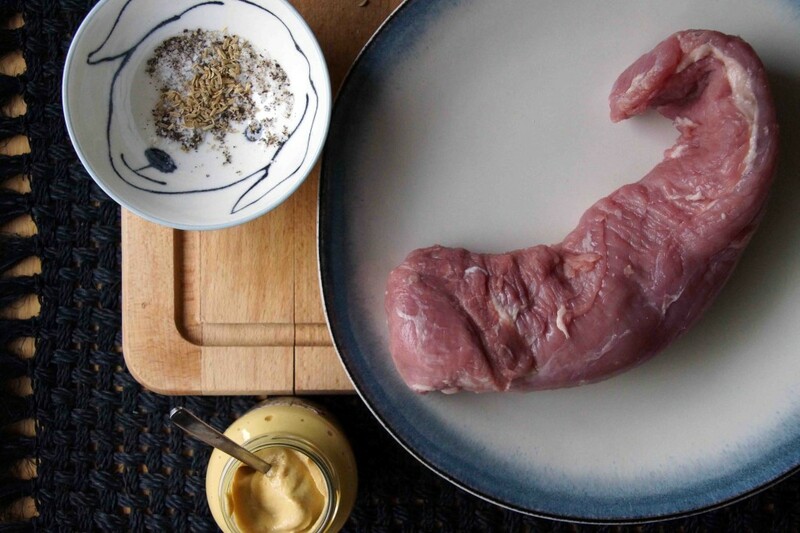 Coat the pork with the mustard. Heat about 1 Tbsp. olive oil in an oven-proof skillet over high heat. Sear the pork tenderloin until you develop a golden crust, about 2 minutes per side, 8 minutes total. Transfer to the oven and roast until just rosy in the center, 8-10 minutes. Transfer to a cutting board, loosely tent with foil, and let rest for 10 minutes. Slice the pork tenderloin in ½ in. thick pieces, cutting at a slight diagonal against the grain. Transfer to a warm platter or divide between dinner plates. Spoon a few of the plums over the pork and put the rest in a small bowl to pass at the table. A handful of arugula or sautéed Swiss chard makes a good accompaniment. 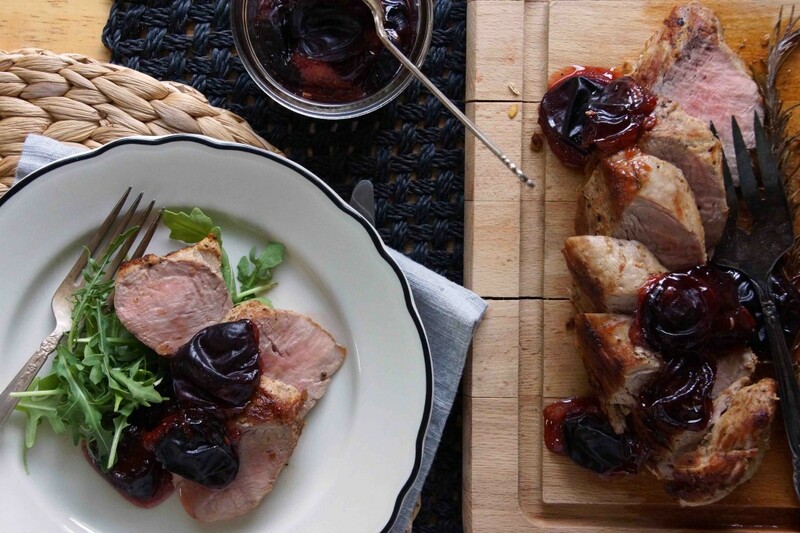 This recipe makes enough plum jam for 2 tenderloins if you're feeding a group. Ahhh, the beginning of fall cooking??? Looks wonderful! The new blog design looks great and I love pork tenderloin with fruit. 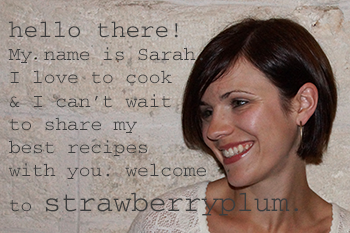 I normally make mine with apples but plums sound so yummy. I want to lick the air…sounds like fun!! !